The greatest gift we can give students is the ability to seek out information independently and create new content based on their passions. “What if you could learn about anything you wanted?” This is what Lee Araoz, the District Coordinator of Instructional Technology for Lawrence Public Schools in Nassau County, asks his 6th grade students every school year. “Genius Hour,” a movement of inquiry-based and student-directed activities, allows students to choose and investigate a topic of their choosing. Genius Hour is based on Google’s philosophy called “20% time,” where employees are permitted to work on projects that interest them 20% of their work time. Notable triumphs to come out of the 20% policy include Gmail, Google Talk, and Google News (D’Onfro). Educators adapted this policy into the classroom, intrigued by the “honest passion and drive that resulted from Google’s employees” (Kesler). Araoz has been teaching for 29 years and currently serves on the New York State Education Department’s Educational Technology Advisory Committee (ETAC) for the 2017-18 and 2018-19 school years. Araoz teaches three online courses—Game-Based Learning, Genius Hour Resources, and Tech-Infused Discussion Groups—through Ed-Technology Specialists, an online university that offers graduate courses taught by teachers. Araoz first learned about Genius Hour from Twitter. Araoz emphasizes the importance of utilizing the community available on Twitter, and believes that “a connected educator is a better educator, just like a connected student is a better student.” Don Wettrick, author of Pure Genius: Building a Culture of Innovation and Taking 20% Time to the Next Level, and A.J. Juliani, author of Learning by Choice and Empower: What Happens When Students Own Their Learning, are both are mentors of Araoz and key figures in the implementation of Genius Hour in education. “Sage on the Stage” is an approach coined by educators, which represents a teaching style where the teacher lectures and primarily leads the classroom while students passively listen and take notes. 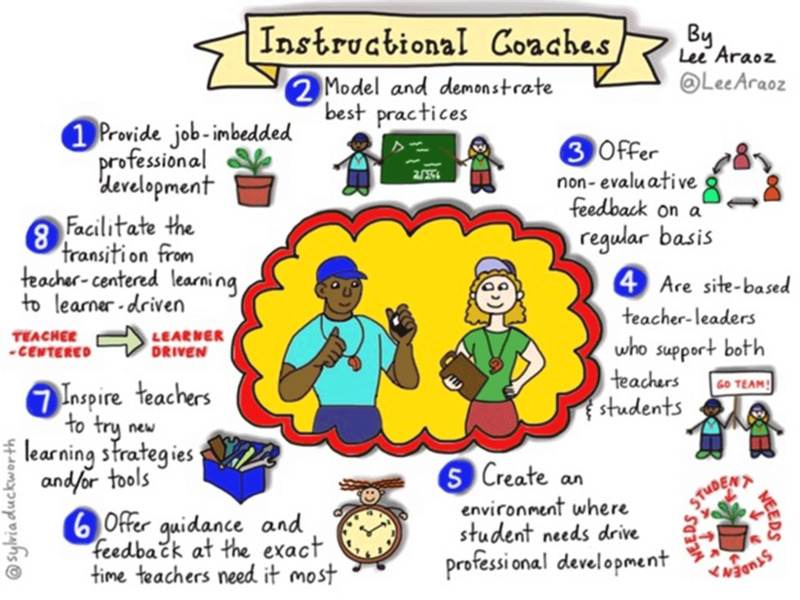 Educators transition from “Sage on the Stage” to “Guide on the Ride” to emphasize a focus on student-driven learning, where teachers are not the sole instructor, but instead have the role of an instructional coach (the methodology of an instructional coach is explained in the below graphic). Araoz began using this term, which was developed by AJ Juliani, a co-founder of the weekly #EdTechChat on Twitter, because he believes it is more fitting of the ideal teacher’s role. Teachers are “active participants of the adventure, and they’re learning just as much as the students do throughout the process,” explains Araoz. “I had always been an energetic teacher, but I was closer to the ‘Sage on the Stage’ approach. I was guiding all of the learning, and I wanted the students to take control.” He wanted to get away from cookie-cutter approach projects where every student does the same thing. "All of these things are skills our students are going to need in the workplaces of the future. It is important that we teach the way the future jobs are going to be set up. In the real-world you are not going to be sitting at your desk alone. If you encounter a problem, you are going to call a colleague, search for the answer online, or look to a community on Twitter." Araoz was also concerned about students being consumers. As a parent, he knows how much the younger generation consumes content from television, phones, and computers. Genius Hour, on the other hand, transforms students from passively consuming technology to actively creating it. One student created his own Role-Playing Video Games, while another student investigated giraffes by creating a review game on Kahoot! and a Google Map of Africa that demonstrated where giraffes live. Araoz said that “anyone can consume content. We must teach our students how to create content.” Genius Hour provided this opportunity for students to create content. The 4C’s of 21st century learning are collaboration, communication, creativity, and critical thinking. Educators have recently added two more: character and citizenship. Genius Hour provides opportunities for students to practice each of these qualities. Araoz has been implementing Genius Hour for six years, and usually incorporates the activity into his curriculum after state testing in the spring. “The key to Genius Hour is to modify it to fit your individual needs.” Some teachers do cycles, and some teachers have transitioned Genius Hour into a class. “My process has evolved over the years,” Araoz explains. “What I started with six years ago looks totally different from what I am doing now.” Araoz believes that it is important to always reflect on the process and ask for student input. He makes time for his students to reflect prior to Genius Hour, during the process, and at the end. Araoz modifies Genius Hour each year, and always asks his students what he can do to improve their experiences. Genius Hour typically begins with a question. The question is chosen by the student after brainstorming five questions (one related to each mathematics, science, and social studies, and two questions are reserved for the student to choose), and then deciding which is the best question to futher investigate.The ideal question should be one that the student cannot easily find the answer from one search on Google. Examples from Araoz’s most recent class include: What are the possibilities of coding? ; Why do frogs have big, bulging eyes? ; Can black holes be used as a power source? ; and How does bullying effect one’s health? Araoz implements loose guidelines to ensure that students stay on task; his “four pathways to genius” allows students to choose whether they would like to invest their time to create (invent something new and sharing it), change (start a movement and make a difference), share expertise (share something they are great at), or inquire into (learn more about a curiosity). Araoz offers ideas for students who do not know where to begin. He provides sugestions, such as creating a digital poster, a Prezi presentation, a Google Site or recording a speech using Screen Castify documenting what they have learned. In his district, Genius Hour has been implemented in grades 3-6 and at the high school level. The activity is adjusted to the grade level of the students participating. For example, younger students think of three essential questions instead of five and use kid-friendly research websites. Araoz tries to avoid Google and Wikipedia at all levels because Genius Hour is about the process, not the result. He explains, “the process component of Genius Hour is where the real-life skills come in, like being able to research and curate content in today’s fake-news environment. You must teach the kids how to discern real information from fabricated information, and how to cite sources and back up information.” Genius Hour also forces students to present their information with their audience in mind. Araoz believes that although technology not required to do Genius Hour, it does drastically empower the activity, especially for ESL students and students with disabilities. Araoz believes that “technology is the universal language; it is the great equalizer. If there’s a student who cannot read or write well, they can create a video or screencast.” In Araoz’s first classroom, technology was not always available, so he went to the computer lab and did Genius Hour once a week. He is fortunate to be in a 1:1 environment in his classroom, but his district is not. Many of his students come from high-poverty areas, so most of them do not have computers; however, he encourages and provides ideas for students to get the most out of their cell phones. He likes to remind students that their phone is a very powerful computer. They can research on their phone and take videos. “It’s not just for Snapchat and playing games,” Araoz said. "The classroom is full of movement, small groups, and energy. If you’re a teacher who is used to the cemetery effect, it’s going to be stressful, but not every kid thrives in an environment where they’re sitting quietly and observing what a teacher is sharing. It’s important for teachers to provide opportunities for students to learn in different ways. Learning is not neat and structured; it is all over the place." Araoz describes Genius Hour as more of a mindset than a project. “Giving control of your classroom to the students and letting them drive the instruction is hard, especially for teachers who have been leading instruction for years,” Araoz noted. Genius Hour has influenced his teaching style year-round. He follows the philosophy that a student-centered approach is more powerful than teacher-centered. Araoz provides choice as often as he can to keep his students engaged. “Is it more difficult? Yes. Instead of grading 25 posters, you are grading 3 posters, 7 videos, 5 PowerPoints, and a skit. But the students are so much more passionate about what they’re doing,” Araoz explained. The importance of Genius Hour lies in the power it gives to student voice and choice, especially in the 21st-century classroom where it is easy for technology to dominate lesson plans. “It is important for teachers to give students an opportunity to independently seek out the answers to their own questions.” Control over the topic not only interests and engages students but allows them to practice their passions. Time will always be an issue, and so will curricular restraints. Araoz said that he often gets questions regarding how teachers can fit in Genius Hour when they have so much content to cover. To this, Araoz responds that “just because it’s called Genius Hour, doesn’t mean it has to be a full hour each week.” When Araoz is limited on time, he often uses the last 10 minutes at the end of the period for students to work on their own individual projects. Araoz believes that “when students are given the freedom to choose, teachers are often surprised by what is produced.” Genius Hour provides choice, content creation, real-world application of 21st century skills, and application of knowledge. While it may take a great deal of effort and preparation, the results that inspire creativity and passion are well worth the time. D’Onfro, Jillian. “The truth about Google’s famous ‘20% time’ policy.” Business Insider. April 17. 2015. Kesler, Chris. Genius Hour, 2018.